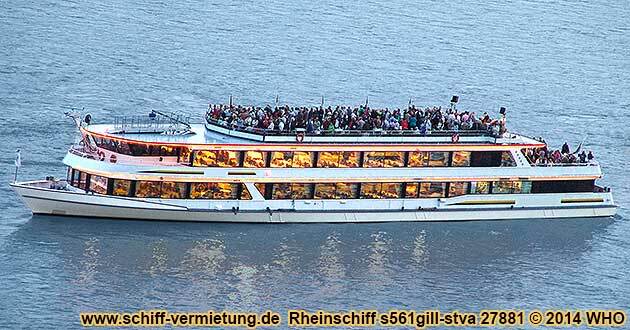 Rhine River boat s561gill-stva, length 56,35 m, width 10,60 m, with departure in Vallendar and Koblenz on the Rhine River. Approved up to 600 people. Up to 456 seats below deck. round cruise boat ticket(s) for adults and children from 15 years offer no. BOF0907gill together with welcome drink, 3-course menu and wine tasting per person 62 EUR. There is a 19% added value tax included in the boat ticket price. Price change because of tax increase, diesel price increase, increase of the firework fee etc. possible until 4 months prior to the boat cruise date. If there is a price increase you have the right to cancel the boat tickets free of charge. Saturday, September 28, 2019, Boppard on the Rhine river. October festival boat trip to the firework "Luminous Night on the Middle Rhine river" with round river cruise. Firework on the Rhine river banks on the opposite side of Boppard, 1st wine festival in the wine town Boppard. Departure in Vallendar on the Rhine river 6:00 p.m. (right Rhine river bank). October festival round boat trip on the Rhine river upstream along Coblence / Koblenz with fortress Ehrenbreistein and Deutsches Eck (German corner), Lahnstein with Burg Lahneck, castle Stolzenfels, Rhens with Konigsstuhl, Braubach with Marksburg, Brey, Spay, Osterspai with castle Liebeneck to Boppard with Kurtrierische Burg (Trier elector's castle) to the firework at about 8:45 p.m. The boat cruises during the firework in front of the old town of Boppard. The firework displays opposite of Boppard can be seen from the open air deck or upper deck. Seating place below deck, DJ music and dance. Return in Vallendar on the Rhine river at about 11:20 p.m.
Departure in Coblence / Koblenz on the Rhine river 6:30 p.m. (left Rhine river bank). October festival round boat trip on the Rhine river upstream along Lahnstein with Burg Lahneck, castle Stolzenfels, Rhens with Konigsstuhl, Braubach with Marksburg, Brey, Spay, Osterspai with castle Liebeneck to Boppard with Kurtrierische Burg (Trier elector's castle) to the firework at about 8:45 p.m. The boat cruises during the firework in front of the old town of Boppard. The firework displays opposite of Boppard can be seen from the open air deck or upper deck. Seating place below deck, DJ music and dance. Return in Coblence / Koblenz on the Rhine river at about 11:00 p.m.
561-lwei Hotel in Ober-Lahnstein on the Rhine River near the landing stage for the boat trip to the Wine festival Boppard. Arrival in Coblence / Koblenz. Coming from the south from the freeway exit Coblence / Koblenz-Nord (north) (A 48) resp. from the federal highway B 9 from the north, drive in Coblence / Koblenz over the four-lane Neue Moselbrucke (new Moselle / Mosel bridge) (Europabrücke) (Europe bridge). Range yourself into the 2nd land from the right, drive into the distribution circle and turn off´in direction center and theater. Drive about 900 meters straight ahead and turn right at the Hotel Trierer Hof / Theater. After about 250 meters, following the decal information Altstadt (old town), turn left. After driving about 200 meters in the opposite direction, turn right into the Stresemannstrasse. Drive about 200 meters until the Konrad-Adenauer-Ufer (shore). At the Konrad-Adenauer-Ufer there are parking possibilities. Besides this, you'll reach the parking lots on the Deinhardplatz (place) and in front of the castle from the Stresemannstrasse. The boat landing stage 9 (Gilles) is at the Pegelhaus (water level house) between the Stresemannstrasse and Rheinstrasse. Coming from the south over the federal highway B 9 turn right behind the BP gas station into the Mainzer Strasse after you've driven underneath the Sudbrucke (south bridge). At the first traffic light turn right further into the Mainzer Strasse and keep the main direction. After about 2.8 km turn right after the castle into the Stresemannstrasse. From there it's about 200 meters until the Konrad-Adenauer-Ufer. You'll reach parking lots on the Deinhardplatz (place) and in front of the castle from the Stresemannstrasse. boat tickets for children from 10 to 14 years with own seating place offer no. BOF0907gill together with welcome drink and 3-course menu per child 59 EUR. boat tickets for children until 9 years with own seating place offer no. BOF0907gill together with welcome drink and 3-course menu per child 56 EUR. Giving of the boat tickets only together with dinner. Advanced meal order necessary. On this boat, you can only choose between the below mentioned meals. No other meals are offered during the firework events on this boat. The boat line doesn't accept ticket reservation(s) without selection of a meal. If you don't choose a meal, we assume that you wish the first meal "3-course menu" and will reserve "3-course menu" for you. The later change of the meal reservation by groups with less than 15 people is liable and is to be paid by the customer. The later change of the meal reservation by groups with 15 or more people is liable and only has to be paid by the customer after a bill has been issued. Portion(s) 3-course menu (the detailed meal offer still to be announced.